In September of 1968, eleven months after Ernesto Guevara’s death in Bolivia, I was starting elementary school. Every morning before classes began, I, along with all the children on the Island, saluted the Cuban flag and said the following motto: “Pioneros por el comunismo, seremos como el Che” [We, the Pioneers for Communism, shall be like Che]. The hero who had physically disappeared in Bolivia had been transformed into the main reference point for generations of Cubans taking part in the task of building the future of a new country. Without any doubt, this Argentine revolutionary accumulated more than enough achievements to provide us with the example that would tower over us. From his first conversation with Fidel on a cold night in Mexico in 1955, as the Commandante himself has described, Che and Raúl Castro Ruz became the first members of the group that would set out for Cuba on the Granma: as of that moment, his wholehearted dedication to the Cuban cause was proven. 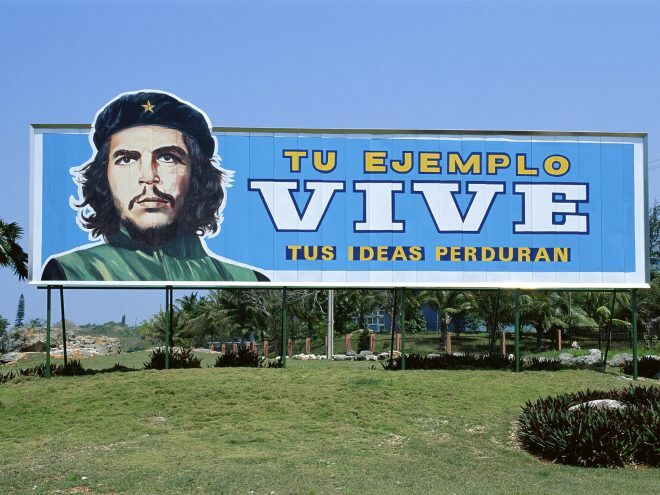 Che was a fundamental pillar in the revolutionary undertaking, in the complicity that spontaneously developed among the guerrillas and the peasants in the Sierra Maestra and which came to nourish and fortify the nascent Rebel Army. Fidel was soon able to appreciate his talents as a combatant after the initial battles of La Plata and El Uvero. While he fought in the mountains, Che also acted as medical doctor and he was crucial to the effort to teach some of his comrades-at-arms to read and write, an example of his profound sense of humanism. In 1957, Che was promoted by Fidel to Commander of a second army column, and in February 1958, he was named Commander of the No. 8 Ciro Redondo Invading Column: in the last days of December that same year, this column would write some glorious pages in the history of the campaign in Las Villas province, among them the derailing of the armored train and the Battle of Santa Clara. According to some historians and participants, the battle was a bloody one and went on from December 28 to January 1, 1959. It was there that the genius of Che as a guerilla leader was put to the test and it was extraordinarily manifested in that city. The clandestine radio station Radio Rebelde (Rebel Radio), which broadcast news directly from the mountains, was founded by Che on February 28, 1958. After the triumph of the Revolution, Ernesto Guevara was proclaimed a Cuban citizen by the Revolutionary Government and fulfilled every one of the tasks assigned to him by the fledgling Revolution in exemplary fashion as Minister of Industries, President of the National Bank of Cuba and representing the people and the new government at important international meetings and events. On a daily basis, Che was known for warmly interacting with the people and he introduced the practice of voluntary work. He also fervently encouraged the exercise of social conscience as one of the key strategies in the building of a new society. His contributions to such practical issues as economic theory are also highly valued. And so on June 14, 1987, construction began on the Ernesto Guevara Memorial. The square, museum, podium and monument dedicated to the Heroic Guerrilla were inaugurated on December 28, 1988 at the commemoration ceremony for the 30th Anniversary of the Battle of Santa Clara. The square and podium of the complex were designed by architect Jorge Caos Campos and sculptor José de Lázaro Bencomo. The museum was created by architect Blanca Hernández Guivernau while architect José Ramón Linares Ferrera was in charge of organizing the museum layout and exhibits. The square is over 17,550 square meters in size. Fourteen palm trees are planted at each side, symbolizing the date of Che’s birth: June 14, 1928. It is designed to hold political and cultural events with a capacity for 80,000 people. The monumental sculpture provides a moving scenario for all who contemplate it, bringing us closer to the spirit of the Comandante de América. The relief mural shows the different stages of the struggle in the Sierra Maestra, the figures of Fidel Castro, Camilo Cienfuegos and Che Guevara, the invasion by Columns 2 and 8 of the western part of the country, Che in the Escambray Mountains and, finally, the Battle of Santa Clara, the capture of Barracks No. 31, the derailing of the Armored Train and Che himself as the symbol of the liberated city. His mortal remains are resting inside the memorial. They were brought there on October 17, 1997 after being found in Bolivia and passing through Havana. The remains of most of his comrades who fell in Bolivia accompany him, including those of the always cherished guerrilla Tamara Bunke. The actual Museum is found on the ground level of the complex and its permanent exhibition provides visitors with a chronological journey through the life and work of Che. Photographs, objects and documents show the different phases of his life taking us through his childhood, adolescence and youth, placing emphasis on the family milieu in which he was brought up. The Ernesto Che Guevara Memorial is one of the most beautiful and intense historical/artistic sites in Cuba and it is a unique way to learn more about the history of the Cuban Revolution.